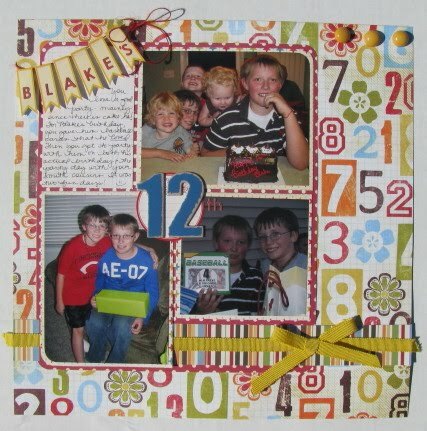 I really enjoyed working with the February "Moments & Wishes" main kit from Polka Dot Whimsy. 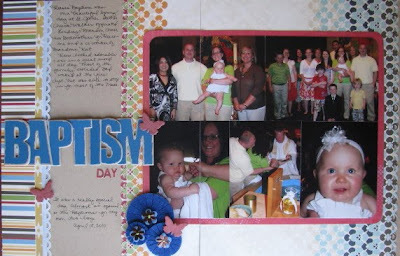 I made a 2-page 8-1/2"x11" layout about Reese's Baptism last spring. Even though I didn't have two of any sheet of paper, I made it work. I cropped a sheet of kraft paper down to 8-1/2"x11" and then cropped a sheet of the Webster's Pages patterned paper down to 12x11. 3-1/2" of that pattern overlapped the kraft. I also added some strips of coordinating paper down the left hand edge of the page. I liked the felt flowers from Epiphany Crafts, but peeled the layers apart to make three flowers out of one. Then I layered some "doo dahs" from teh kit on top and finished the dequins off with a knot using floss. 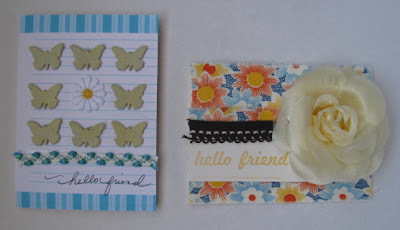 I misted the Jenni Bowlin butterflies with Mr. Huey mist by Studio Calico. 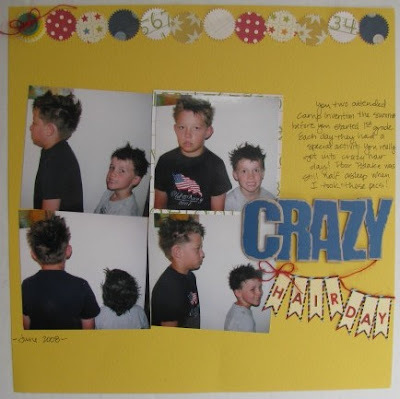 I made a simple layout for Kevin's album to document crazy hair day at a week-long educational camp the boys attended a few summers ago. I loved mixing the Pink Paislee alpha with the tiny Basic Grey alphas on the banner stickers. 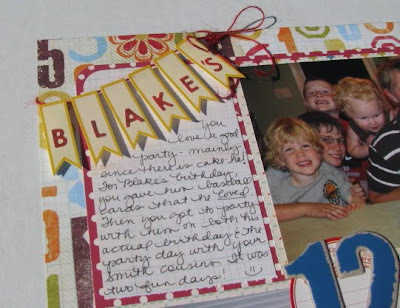 I put my new Martha Stewart shape punch to good use on this page. 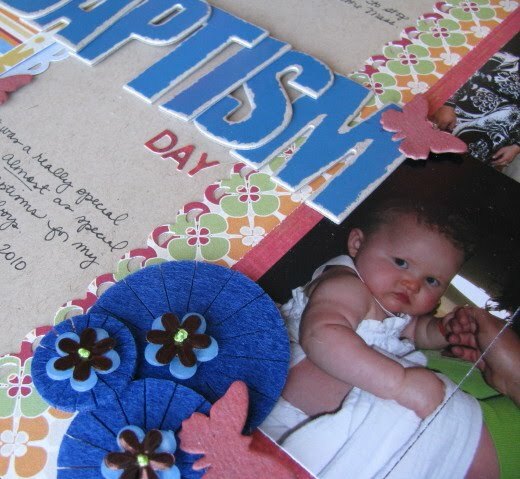 I also layered one of the Epiphany Crafts Vintage Settings with a button and twine. 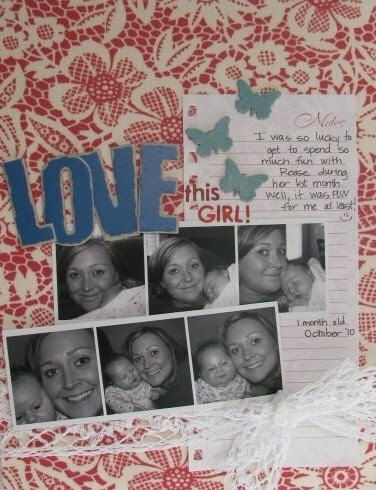 These black and white shots of me and Reese went perfect with the Jenni Bowlin red floral paper. I kept the layout super simple by just using the one paper, sheet of notebook paper, two alphas, wide trim and chipboard butterflies. The layout came together quick! I inked my butterflies for this layout. Finally, I completed a couple of cards. Lately I've been wanting to send some "just because" cards to friends. "Hello Friend" is a very appropriate greeting, so I used it for both cards. That's what I have 'so far'... I still have a ton of scraps. The preview for March went up today. It looks like another great kit! Beautiful work Amy, love your cards! Great layouts! Those banner stickers are so cute! Stunning layouts...I love that Alpha and those banner stickers will have to go on my "must have" list. Great projects! I love the chip board letters. 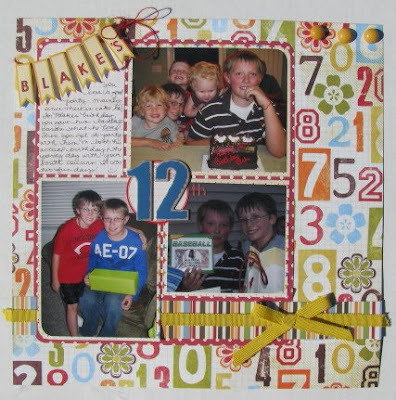 Love what you made with the kit Amy! !